Antony in the classic 1952 cartoon ‘Feed The Kitty’. 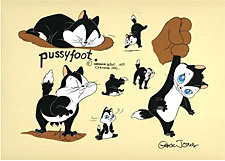 Based on the classic animation art of Chuck Jones, this edition captures the various looks and poses of Pussyfoot in a re-creation of the the original Jones model sheet as a hand-painted cel featuring the cuddly kitten. Each work of art features the Estate Signature of Chuck Jones.